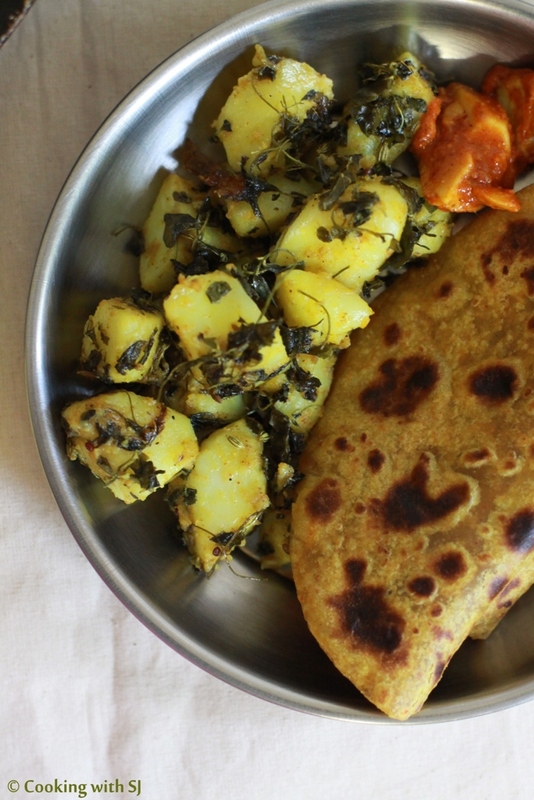 One veggie that’s considered as the best comforting food is… Potato! And believe me, I have been in touch with people who used to have potatoes and only potatoes in lunch/dinner!!! Yes, my Jiju is one of them ;) I was a picky eater too so I have always enjoyed his company. But then having no other veggie at all wasn’t my cup of tea! These days, he’s on cooking spree… Shares his culinary adventures with me every now n then… And from those pics, I assume he has started eating many veggies! My mum used to say, your taste buds keeps changing as you grow… Very true in my case too! But let’s talk about potatoes… I love it more ‘coz I can have it paired up with any other thing, may it be a green bunch or any other veggie! And works great in any form… Steamed, pressure-cooked, kadai-cooked, fried, baked, sundried ;) A few days back, I wanted to make traditional Gujarati SukiBhaji… Prepared everything for that only! But when I opened a drawer of spices, I found a box of Kasoori Methi (dried fenugreek leaves), sundried & packed by my mum… She handed over a bag of it while I was packing my stuff to fly back :D Was tempted to use these dried methi instead of fresh ones in making of this perfect comfort dish! Heat oil in kadai, add cumin seeds and let it crackle. Add hing, green chilly and saute it for a while. 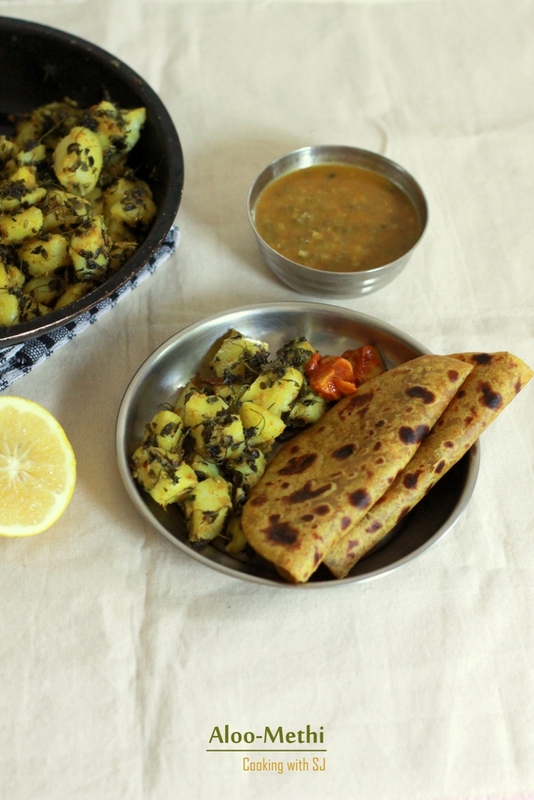 Add potatoes and kasoori methi into it along with all the spices. Mix everything well, drizzle some water over it and cook it covered for a few mins. Turn off the heat, add lemon juice and quickly mix it. 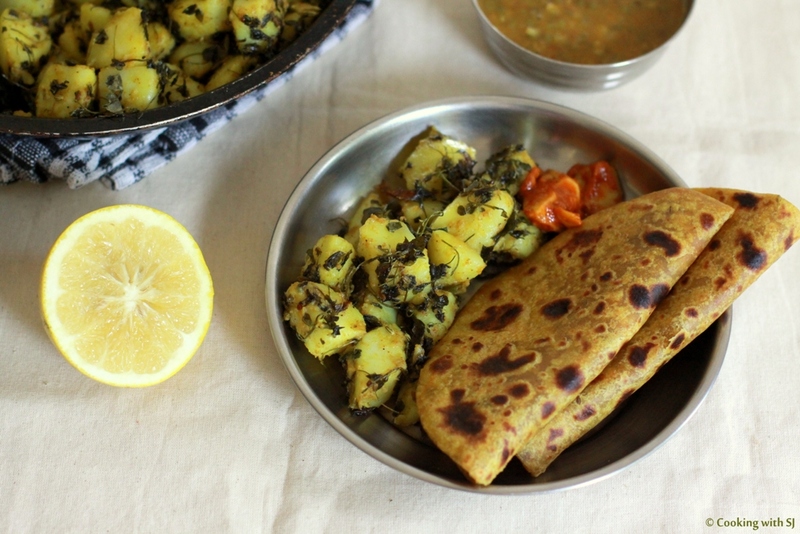 Serve warm with Masala Thepla!!! You can use red dry chilly for tempering. High five girl! That’s how I make my aloo methi :). Actually it comes out better with Kasuri methi.